The Apple Maps debacle sends the latest signal that the perfectionist culture at Apple is eroding. Apple ( AAPL - Get Report) fans should heed that message, particularly in light of the embarrassing inclusion of a subpar maps application in the new iOS 6. At the moment, I admit, it seems absurd to criticize Apple. I even cringe when I read my own stuff. It's not easy to go against the grain, particularly when you're doing so vis-a-vis a company you love, respect and spend a ton of money with while it continues to power ahead as the cheapest stock on the market. That said, so much of what matters in tech's big picture has to do with what will happen tomorrow, not all that's good about what's happening today. 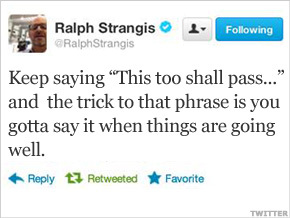 The more experience you have as a human, the more you realize just how profound Strangis's advice is. Former Intel ( INTC chief Andy Grove wrote a timeless book about leadership, Only the Paranoid Survive. He felt in good times, great leaders needed an attitude of "this too shall pass," using the time to anticipate threats and prepare themselves to respond fast and effectively. Grove discusses "Strategic Inflection Points," where something happens -- a shift in technology, new regulations, a competitive salvo -- that changes a company's business overnight. In a blurb on Grove's book, Steve Jobs said, "You must learn about Strategic Inflection Points, because sooner or later you are going to live through one." Because it lacks credible competition, Apple faces few external threats that we know of. Of course, that's the tricky part about external threats; you do not necessarily see them coming. Great CEOs have to act, in part, like Hollywood producers, dreaming up seemingly unthinkable alternative scenarios to the status quo. They must see the writing on the wall. But, again, the human experience teaches us that when you're the graffiti artist, you're often blind to it. Coupled with the task of managing after Steve Jobs, Tim Cook appears to be in an impossible situation. I see the writing on the wall. And, despite how strange it feels to be anything resembling bearish, I can't ignore it. I'm not going to swallow fireballs to try to convince you. Just read a few passages, look yourself in the mirror and tell me if you really think it's crazy to question Apple's long-term future during a time of unprecedented dominance. Now, there's no question that Apple will improve Maps over time. Sources tell AllThingsD that the team assigned to the app is under lockdown right now working to fix it. But it's unfortunate that it was ever released in this condition in the first place. We are excited to offer this service with innovative new features like Flyover, turn-by-turn navigation, and Siri integration. We launched this new map service knowing it is a major initiative and that we are just getting started with it. Maps is a cloud-based solution and the more people use it, the better it will get. We're also working with developers to integrate some of the amazing transit apps in the App Store into iOS Maps. We appreciate all of the customer feedback and are working hard to make the customer experience even better. Gripping any phone will result in some attenuation of its antenna performance with certain places being worse than others depending on the placement of the antennas. This is a fact of life for every wireless phone. If you ever experience this on your Phone 4, avoid gripping it in the lower left corner in a way that covers both sides of the black strip in the metal band, or simply use one of many available cases. Classic Steve Jobs. It's not us, it's you. Of course, Apple will get mapping right. It's not like the company is no longer capable. But, as Paczkowski pointed out, how could Apple even release a key feature with such flaws? By many accounts, it's in pretty bad shape, at least relative to Google ( GOOG maps. If you can blame Jobs for anything, it's that maybe he hired "B" players who he thought were "A" players. When the decision to drop a feature as popular as Google Maps happens too soon, it's a sure sign that the "B" players have too much power. When this occurs, you worry less about Strategic Inflection Points; instead, Tim Cook needs to be on the lookout for a Bozo Explosion. Without Steve Jobs to consult, Apple has to figure out whether to eat crow and crawl back to Google's door or take more heat as it attempts to mitigate this not-so-small disaster. Meantime, it furiously works to perfect something that never would have made it past Steve Jobs's desk in unfinished form.